Understanding the kinds of editors is one of the hardest things for writers. At least that has been my experience as an editor. Usually new writers have a tougher time understanding the differences, but sometimes the experienced ones aren’t quite sure either. I had the honor of leading a chat for the 10 Minute Novelists group, and I shared those differences with the group. I enjoyed sharing my knowledge in the chat that I thought I would share the information here. Believe it or not there are four kinds of editors. I only one or two of them for my own novels, but not my other writing. As an editor and proofreader, I don’t usually hire anyone to edit my blog posts, but for my novels, I do. Depending upon what you can afford and what you need for your book, you can use a developmental, or sometimes called a substantive, editor to help with plot structure. This person helps you fix plot holes and other plotting problems as well as character descriptions. You could say this editor is a writing coach, cheering you on to publish a great manuscript. Like the name suggests, a line editor reads your manuscript line by line. Sometimes writers confuse this kind with a copyeditor. However, they each do different things. A line editor looks for things like grammar, punctuation, and spelling errors. This person also checks sentence structure as well as the transitions between paragraphs. A copyeditor is slightly different from a line editor. This person does similar thing, but isn’t as detailed as a line editor. This person looks at grammar, punctuation, and consistency issues. Like for example, if a character has a birthday in May in one part of the book, but the character has a birthday party in December, the copyeditor would catch that kind of mistake. This person would look for changes in dates or names, too. This is the last step in your manuscript’s editing process. Part of the word itself comes from a proof. The person would look at a proof one last time before the printer took it to be printed in a book, a newspaper, or other types of writing. A proofreader will look for formatting issues, typos, repeated words, and spelling. This person won’t be making any big changes to your book, only small things. It’s a one last time read through making sure the novel is as perfect as can be. 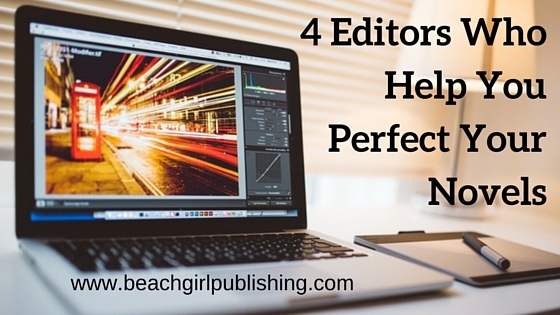 If you self-publish your books, you will only see these four types of editors, if you choose to use all of them, because you will do the rest of the steps to publishing. If you publish the traditional way, then you will have an acquisitions editor. This person works for a publisher and is in charge of getting the books. This editor is the person an author will contact as the novel goes through the process of publishing. One of the the things I stress the most about self-publishing a book is to make sure you have it edited by another person. That person needs to be able to look at it objectively and give you good feedback. If you have a poorly edited book, you won’t sell any copies. In fact, the reader may ask for a refund. I have read books with many errors and usually don’t finish them. If your budget is tight, I would at least get a copyeditor or possibly a line editor to read through your manuscript. And if that isn’t in the budget either, then find a writing friend who can give you honest, even brutal, feedback about your novel. What kind of an editor have you used? If you haven’t used an editor, what kind do you think you will use? 1. I pay for two rounds of editing – developmental when the book is in an early draft stage and final when I’ve taken the book as far as I can by myself. For that final stage, I need a combination copy and line and developmental edit. I need the grammar checked but please don’t restrict yourself to just that. If a paragraph is clunky, tell me it needs to be reworded. If a character is coming off as 1D, let me know. 2. Success in indie publishing relies as much on quantity as it does quality. I want my product to be the best possible, but when I’ve solicited that final stage editing from you, I’m looking to make all the quick fixes that I can and get it out the door so I can get to producing my next book. Each book doesn’t need to be a masterpiece so don’t tell me that the entire story needs to be rewritten from scratch. Instead, give me concrete, actionable items that can be addressed to give the readers the best experience possible. Thanks for your response. As an editor, I tend to go above and beyond what I say I will do. I’ve always received great testimonials on the editing I do.